In 1972, Jeanne Manford started an international movement when she marched with her son Mortie in New York’s Gay Pride Parade. Enraged that her son had been beaten at a gay rights protest two months before while police did nothing, she carried a sign at the Pride march that said, “Parents of Gays: Unite in Support of Our Children.” 30 years later, PFLAG has grown to include more than 500 chapters nationwide, over 250,000 members, supporters, and affiliates, representing the largest chapter network in the struggle for gay, lesbian, bisexual and transgender (GLBT) rights. The idea for PFLAG began in 1972 when Jeanne Manford marched with her gay son in New York's Pride Day parade. After many gay and lesbian people ran up to Jeanne during the parade and begged her to talk to their parents, she decided to begin a support group. The first formal meeting took place in March 1973 at a local church. Approximately 20 people attended. In the next years, through word of mouth and in response to community need, similar groups sprang up around the country, offering "safe havens" and mutual support for parents with gay and lesbian children. Following the 1979 National March for Gay and Lesbian Rights, representatives from these groups met for the first time in Washington, D.C. In the early 1990s, PFLAG chapters in Massachusetts helped pass the first Safe Schools legislation in the country. In 1993, PFLAG added the word "Families" to the name, and added bisexuals to its mission and work. By the mid-1990s a PFLAG family was responsible for the Department of Education’s ruling that Title 9 also protected gay and lesbian students from harassment based on sexual orientation. Also in the mid-1990s, PFLAG put the Religious Right on the defensive, when Pat Robertson threatened to sue any station that carried our Project Open Mind advertisements showing examples of his anti-gay statements. The resulting media coverage drew national attention to our message linking hate speech with hate crimes and GLBT teen suicide. In 1998, PFLAG added transgendered people and their loved ones. 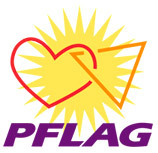 At the turn of the century, PFLAG began to develop nationally coordinated programs in order to better focus the work of our grassroots network. Programs such as our From Our House to the School House campaign, Families of Color Network, Families United Against Hate are already showing results. Most recently the PFLAG National office has launched its new program From Our House to the State House under the direction of the current Interim Executive Director, Ron Schlittler.